Everyone who is ever adopted a rescue remembers the honeymoon period – that stretch where the newly adopted dog is exhibiting the best possible behavior out of fear that it will – once again – have to change homes. Thus, the first sign of bad behavior is a weirdly good sign in that the dog is comfortable and knows the home is secure. Frankie has apparently become VERY comfortable. As we mentioned earlier this week, a new dog slowly earns freedom around the house but starts out with crate time when the humans can not directly supervise the behavior. Frankie has been very good and has earned more and more freedom, so who would think he would figure out a way to get into trouble while INSIDE the crate? Sigh. At least we now know he is truly a Siberian Husky. 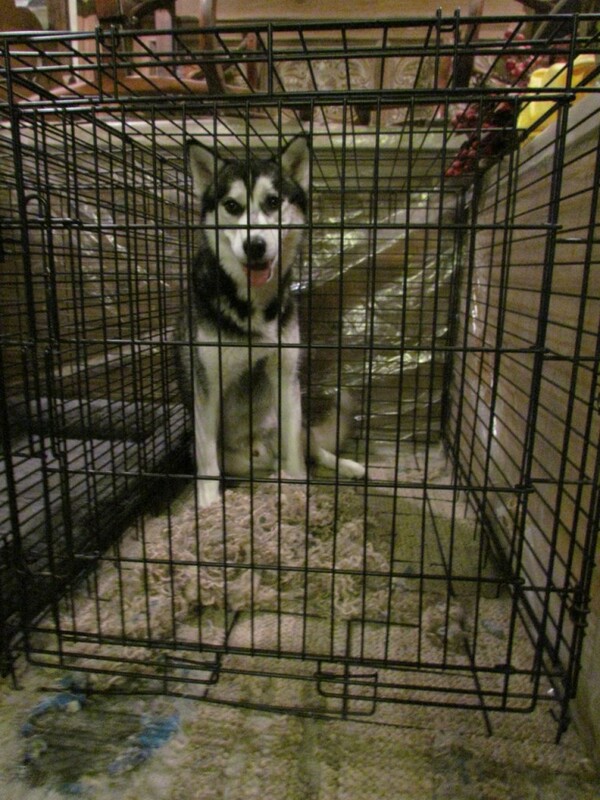 First, in order to cause problems from inside a crate, one must remove the pan in the bottom of the crate. That, apparently, was easily projected across the den floor. 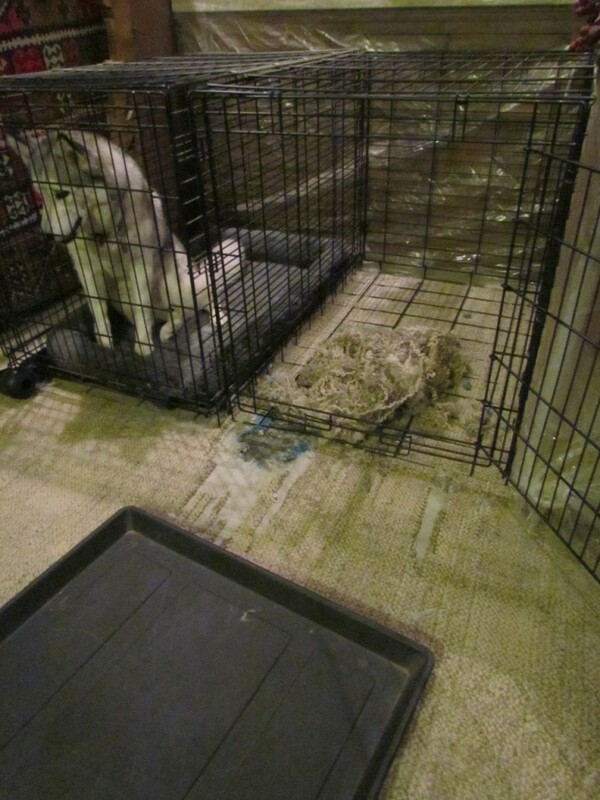 Thus, the bottom of the crate was now directly on top of the carpet. And carpet is good for claw sharpening. And what better way to sharpen claws than to DIG. Natasha is quite impressed that her neighbor ejected the crate pan across the floor. But exactly how far can a dog dig into carpet when they are determined? Apparently to the concrete floor underneath the carpet AND the carpet pad. Notice the fine art work here. 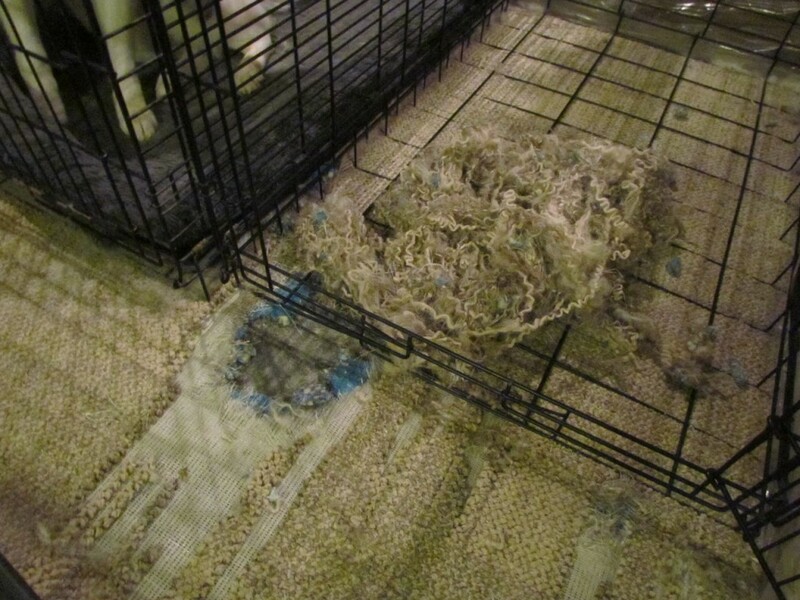 The runs of carpet threads that were ripped up and pulled several feet from the crate. The nice pile of carpet threads pulled into the crate (which apparently makes a good pillow as we came home to find him resting with his head on the pile). Details like this are the sign of quality Siberian Husky work. And some pup is quite proud of his handiwork. P.S. – Have no fear – Frankie’s new found home is quite safe and permanent for him. After all, we have worked with the masters who created Frankencouch. A little hole in the carpet is nothing. P.P.S. – Dear Frankie – Please do not take this as an invitation to top Frankencouch. P.P.P.S. – Rumor has it that a certain Siberian at the Herd Annex – and the not the one who came instantly to your mind – has also declared war on a certain vacuum cleaner. Pictures were not taken, but we will see what we can, err, piece together. HA HA! Gotta make his own bed since apparently he was not outfitted with the cushy crate pad like QNTE. Impressive debut. That is quite impressive, to put it mildly. OH. MY. GAWD. OH. MY. FREAKING. GAWD. And the sibe universe loves people like you (and all sibe owners) who love Sibes in spite of themselves. You are good peeps. Angels. And we still love Frankie too. I’m sure she’ll be khwite impressed! I wonder what the rekhord fur HULA membership is fur I think Frankie has nailed it! Wow – Frankie did some amazing work there!!! LOL! I also read Frankencouch and it was equally hilarious! But I am glad that Frankie is feeling comfortable in his new home! Nicely done Frankie! On tip my humans want me to pass on to your humans is 12″ by 12″ ceramic tiles under the wire crate really deters digging. It will also file down your nails nicely if you do try. Trust me they went through this with me for over a year before they found a solution to my “inside crate destruction”. Good luck! I think this is a good sign. It just shows that Frankie loves you enough to let you see his true personality. Consider yourself lucky! PS. I, for one, would love to see Frankie try to top Frankencouch, but my mom agrees with you. Speechless with this look =0 through the whole read. Oh Frankie, glad you already feel so loved that you decided to test them. Your new humans are truly awesome people to be patient, kind and loving despite this small rip in their carpet. This is why I don’t own a Sibe. I know my limit on patience. I don’t have a lot. God bless all of you Sibe owners who take time, patience and energy to work with them. He’s quite a clever boy! We’re pretty sure it takes a fair amount of creativity ingenuity to impress Queen Natasha! We’re impressed! We are impressed with his handiwork! And look how proud he looks! Picasso? Maybe not but talented for sure! Woo go Frankie!!! Sounds like woo is a full-fledged member of The Herd. You must be so proud to have taken such a master craftsman into your home. To do so much with so little is truly inspiring. Are you sure Frankie is not part bloodhound? Uh huh. Yup. Honeymoon’s over. At Chez Susan, it was when my current canine manager peed on the quilt my dead grandmother made for me. Needless to say, Krystal the Discount Dog, tergle (beagle/terrier mix) and said pee-er, is still in residence. woah…. Frankie! I think he really was just hinting that he’d be more comfortable in his crate with a pillow to lay his head on. Wow, Frankie! Most impressive… But glad you’re feeling at home!! What talent!!! We know he was just trying to make that carpet stand out a bit more!! Good job, good job, dawg!! That is SO impressive! I never had a honeymoon period – I didn’t have a clue how to act at all when I got here, so I plunged right into things like lifting my leg on the centerpiece in the middle of the dining room table, eating Mom’s ruby red slipper, shredding silk flowers … I better stop. But the digging job you did, Frankie? AWE. SOME. Really. I had to give Monty a hug and thank him for not trying that! I’d say his efforts were quite clever and exhibits a high level of Siberian Intelligence. Yeah…that’s it! Gotta love em! Oh my goodness. We once had a foster dog who chewed through our bedroom door. Apparently Frankie didn’t like not having a nice soft space to lay his head, so he made his own. Apparently you need to put a doggie bed in there with him so he is more comfy. It’s a great way to trim his nails. Then the humans don’t have to do it! My Huskies are asking what your problem is! *snicker* It’s not the good dogs that people want to read about on a blog! I suspect that we have a new star in the making here. I’m waiting to see what the Hu-Dad comes up with as a way to prevent future attempts to vacation in China and whether Frankie will thwart those attempts! It’s like our dad always says (quoting another architect), “God…or in this case Dog…is in the details!” Frankie, you are a gifted child and hu-dad should be fostering your thinking outside the box…er, crate! WHOA! I must instantly put a block to this post in Reuf’s IE profile! Next I must say, high five for ingenuity, dedication and dedication. Frankie really invested his heart, soul and spirit in the endeavor… and Reuf’s trainers tell us that’s a really great sign. Dogs in his Heaven and all’s right with his world! AHAHAHAHAHAHA!!! Oh that so brings me back to my first sibe puppu, who latched onto a loop in my berber carpet and managed to unravel the whole carpeted area. Now that was an experience! We so love Frankie!!! You’re just making the crate your own!!! Our Hu-mom, however, told us not to get any ideas!!!!! That is pretty impressive! Nebo has managed to pull several things into the crate and destroy them, he and Killer have both destroyed the plastic pans in the crates and wires on the door, but digging through the carpet from the crate (Keva has done it outside of the crate – while we were home, just for fun I guess?) is something they haven’t managed yet. He’s a husky all right. Yes, I’m laughing!!! Good job, Frankie! Now, your wild time is over, and you can settle into your new and permanent home! And, don’t try to top the couch incident.